Fowey Regatta 2019 - August 18-24 - Cornwall's best-loved Regatta! We’re one of the country’s best-loved Regattas, attracting thousands of visitors, many making an annual pilgrimage. Traditional favourites include the Carnival procession, fireworks displays, the crab-catching competition and Fowey harbour swim, the Giant Pasty ceremony and pasty-eating competition, flora dance and, of course, Fowey Town Band. Plus live music every night on Town Quay. The Regatta is also one of the UK’s best known sailing events. There’s a full programme of races, including the famous Troys, a class of sailing boat built only in Fowey. A week of memories to treasure forever! Your indispensable Events Guide. Fowey Regatta is run by volunteers and every event is funded by sales of this programme. Buy yours from the Regatta Shop in Town Hall or Enjoy! Fowey next to the church. Or buy an online programme to view on your mobile device by clicking here (not available yet!). Cost: £3. Cornwall’s premier Beatles tribute band played a triumphant gig at Fowey Regatta last year, and they’re back by popular request. Over two sets – early Beatles and post-Sergeant Pepper – and numerous costume changes, expect all the hits of the Fab Four. And plenty of singing along! 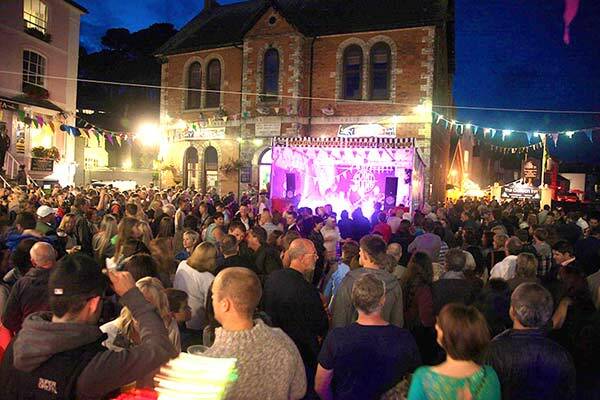 London’s Irregulars have played all over the capital and had the crowd congoing around Town Hall at the last Fowey Cider Festival – so make sure you’ve got your dancing shoes on! The official parachute display team of the British Army and Parachute Regiment are back after last year’s thrilling display (in hardly conducive conditions!). We’re delighted to invite them back, for one of their 60 worldwide formation displays of 2019! Come Tuesday night, the Quay will vibrate to the Celtic-folk-punk of Cornwall’s very own seven-piece Black Friday band.